First up a big shout out to our instructor Tom Heayel, who somehow combines the skills of an athlete with the patience of a saint. He dishes out the instructions as you get used to the FlowRider and boards, and then is as hands-on or hands-off as you need him to be, as all those booked into the hour-long session take it in turns to ride the waves. He is also great with kids, and took our keen eight-year-old and our not-quite-as-keen six-year-old down the waves on a board with him until they felt ready to go it alone (or not!). There were several other children who had obviously been on the FlowRider with him before and loved both him and the experience so much they were back for more. Happy smiley faces all round. 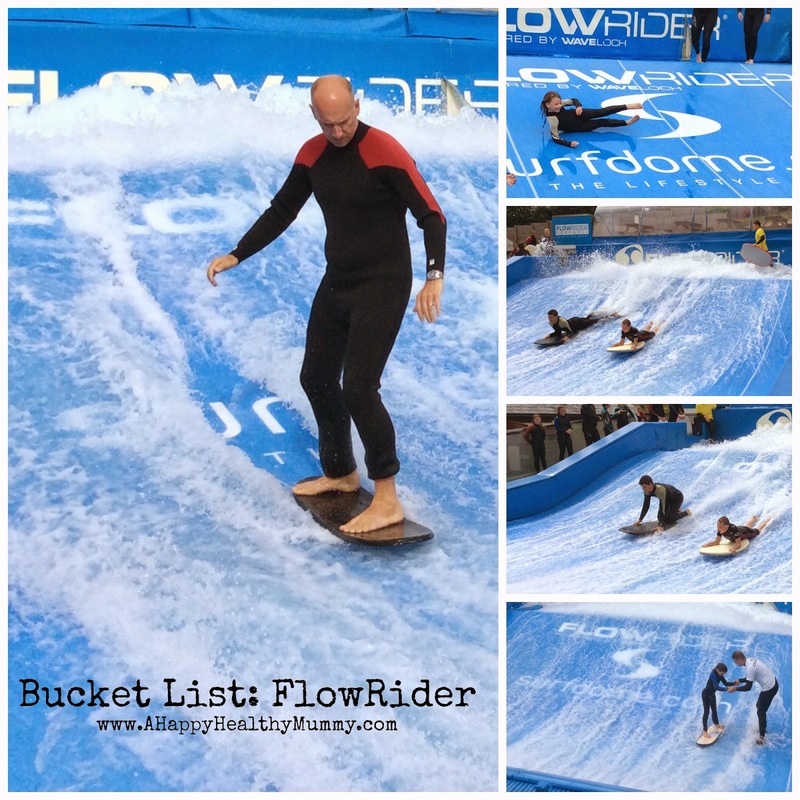 At the beginning of our session, we started out with the water switched off so we could see that the surface of the FlowRider is a bit 'trampoliney', and then once the water was switched on we bodyboarded down on our tummies. The next challenge was to go down the wave and release your board, pushing it out in front of you and catching it as the wave pushed it back. After that, Tom demonstrated how to bodyboard down and then get up on your knees (something I failed dismally at, getting totally wiped out and ending up in the frothy 'pool of shame' at the top end of the FlowRider, with hubby absolutely killing himself with laughter, afterwards saying I looked like I was being repeatedly savaged by Jaws as I staggered up and down trying to regain my composure). From there we progressed to starting off on our knees (I could do that thankfully, one trip to the pool of shame was enough). And by the end of the session we started at the lower end of the FlowRider on a short wooden stand-up board. And yes, I managed to retain my balance and ride the wave all by myself (was it core strength or fear of ending up the class clown I wonder?). At the end of the £25pp session we all jumped into the hot tub to recover (I had got quite cold by then) - the use of which is part of the package (along with the full wetsuit hire). Alongside our family, our group consisted of a 30-something mum (her partner and small toddler had watched) and a dad with his grown-up daughter and her boyfriend - meaning that we were quite a varied lot of ages, sizes, experience and fitness levels, and yet we were all able to enjoy the FlowRider as much as each other. 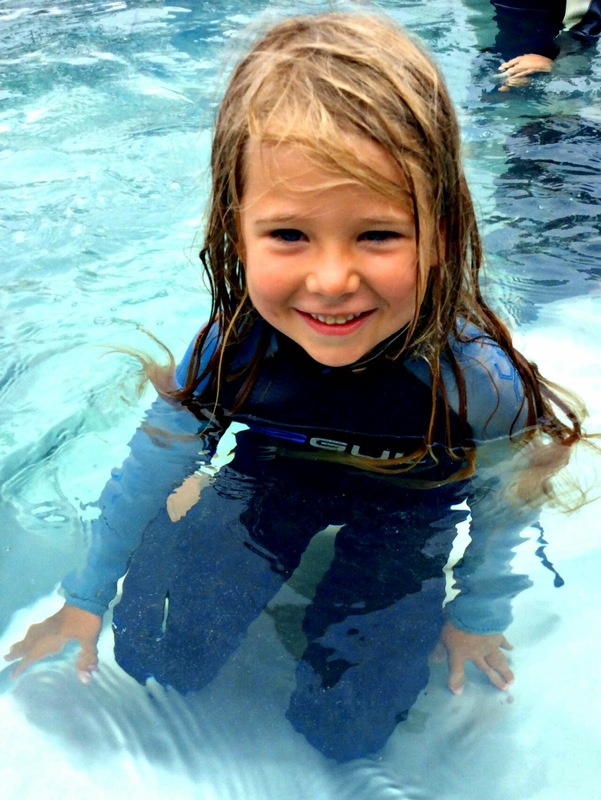 I was amazed that our elder daughter and I had both managed to stay up on the short boards - and impressed that we'd all had a great time doing something out of the ordinary as a family. As well as the FlowRider in Cornwall, you can find the attraction in Bedford and Yorkshire, resorts like the Merton Hotel in Jersey and on cruise ships and hotels and water parks around the world. 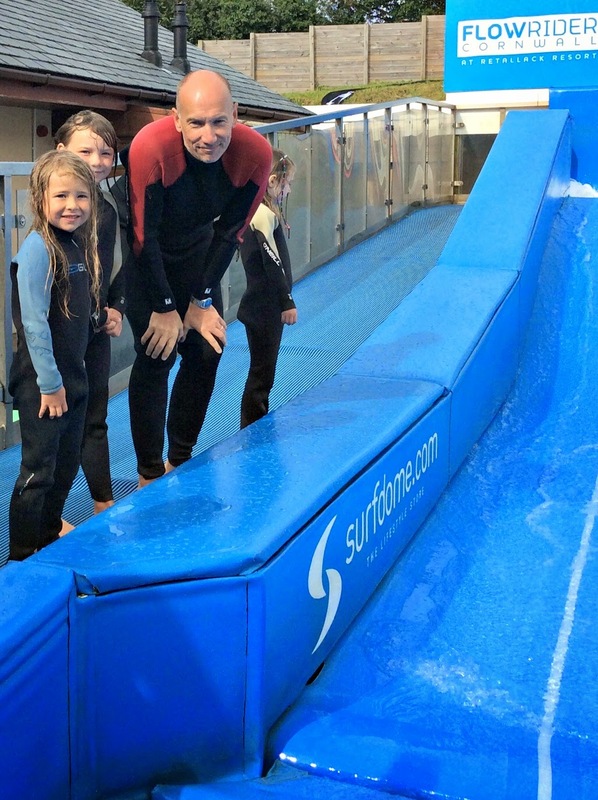 I'd certainly recommend the FlowRider experience for you and your family - rain or shine. So, that's that ticked off on my bucket list (the kids already want to go back). Would you put it on yours? Let me know in the comment box below. According to my husband the last bit is a bit like snowboarding! Always good to try new things (even better if they are in a safer, controlled environment!!). Flow Rider looks such fun. Clio and her friend went down last week and came back full of excitement. I will have to give it a go myself as it is pretty close to us. Lovely photos, a great job whilst you were standing around in your wetsuit, no wonder you ended up cold left in charge of photos! I'm gutted I didn't get a photo of me on the stand up board though (if only to reclaim my dignity!). My girls are desperate to go again! If I can do it - anyone can!! Thanks for commenting. I have to say the instructor was so good with the kids too. Yes lots of fun - my husband in particular enjoyed laughing at me! Thanks for commenting. This looks like immense fun! I'd blatantly be useless. Great for sending daddy & the kids off to then?! I was nervous tbh, but thought 'if not now, when?'! Yep, North Cornwall, so near Padstow etc. Great whatever the weather too (because you are wet anyway, and the hot tub is fab if it's cold). Makes a change from the beach too (if you get bored of sand in your sandwiches!). Well, it's always good to try something new - even if you manage to look like a right wally (which I did, admirably!). Yes, I think there's quite a following as a sport! Do you live near one? That last picture is amazing! She looks so cute! Yes, she LOOKS cute doesn't she!!!!!! I was quite surprised she had a go to be honest. The result of peer pressure! It was actually my first time in a hot tub! I REALLY liked it (I could never really see the appeal before). That looks amazing! I don't think I would have the nerve but I have no doubt Grace would! This sounds like great fun, I'd love to try it. Always worth trying something new! I've always wondered what these were like. Sounds like oceans of fun. I see what you did there!! Thanks for commenting! Hi, thanks for visiting! Oh yes, I had never actually tried a hot tub before - and I LIKED it! It was quite difficult to make myself get out really! I'm off to the circus!